As a vintage clothing retailer, customers often ask me who I’d recommend to tailor classic pieces that don’t fit quite right. Finding the perfect fit is especially tough with vintage pieces that were designed to fit someone who lived 50 years ago, but modern styles can present their own challenges. I typically recommend that my customers call a sewing genius who lives near my shop. She’s not a full-time seamstress — in fact, she has a fast-paced, full-time job downtown — but she spends her nights and weekends teaching sewing classes and providing alterations. How does she stay so busy with this side gig? She offers hours that fit with busy people’s schedules, unlike many dry cleaners that offer alterations. She can also point to her expertise: If a piece of clothing is a customer’s favorite, he might not want to trust the cleaner down the block to take care of it, but this seamstress comes highly recommended. People often want a personal touch in their tailoring. 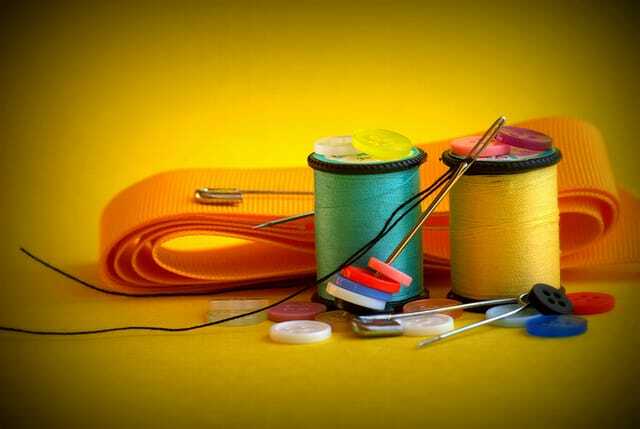 And if you have sewing skills, you could turn your talents into cash by providing that personal touch. Here’s how to get started as a part-time tailor. Do you know how to backstitch, overcast stitch, pad stitch and pick stitch? You’ll have to be well-versed in both hand- and machine-sewing methods before you’re ready to take on clients. If you’ve been sewing since you were young, you may naturally feel ready to go. If you’re still taking advanced sewing classes, ask your instructor what she thinks of your work. She’ll be honest about whether you’re ready to take on clients. Got a simple home machine? Don’t be pressured to upgrade just yet. Typical alterations (hems, seam adjustments, etc.) can be done on a regular old machine. Hold off on upgrading to bells and whistles until you have a few steady clients and cash coming in! Next, take on a few testers. Don’t raid your roommate’s closet without permission, but do seek opportunities to help a friend find the perfect fit. Does your significant other need pants hemmed, or a zipper replaced? Maybe your cubicle neighbor has lamented the hemline on her skirt on several occasions. Make it clear that your services are free for a limited time while you build a client base, and offer to take on the work. Make notes about your experiences with different garments and start to think about what your turnaround time will be. Don’t underestimate the power of keeping a sewing diary to help build your business. Linda, the blogger behind Sew for Dough, relies on this technique for rate development. If it takes 30 minutes to do a hem and they are charging $12 for it, that means that shop is charging $24 an hour to hem pants (30 minutes times 2 = 60 minutes) or (12 x 2 = 24). Now, if you divide the hourly rate ($24) by 60 minutes, they are making .40 cents a minute. Now you have a base rate (by the minute and by the hour) for all the sewing that you do. As you practice, you’ll be able to determine what works best for your new freelance business: providing an estimate based on your minute rate, or charging a flat rate for all similar tasks. One more crucial note as you think about your pricing: Linda advises you to account for the price of thread and needles, along with sewing machine tune-ups. She recommends charging the customer if you need to buy a special piece, like a zipper, for a particular job. While you may end up finding a part-time gig in a local shop, you probably want to work for yourself, right? Even AARP notes that half of seamstresses and tailors are self-employed. Promote your business through word of mouth in a variety of ways. The good part is that they’re all very inexpensive. The bad part? You’re going to have to hustle a bit. Use Facebook, local listservs and other electronic means to notify potential clients that you’re ready to solve their wardrobe issues. Offer friends and family members an introductory rate. Once they take advantage of your services, give them another introductory discount (you can simply print a small flyer from your computer) to share with a friend. Talk to local retailers. Everyone has their favorite clothing shops around town. If you’re friendly with the shopkeepers, let them know you’re taking new clients, and be sure to leave your contact info with them. You can get low-cost business cards, or drop off copies of your introductory rate flyer. This is how I met the seamstress I recommend — she simply introduced herself! Your Turn: Would you turn your sewing skills into cash as a part-time tailor?